Among all the diversity and the culinary richness that you will find during your stay you can not miss Turkish desserts.In Turkey desserts and sweets are often consumed between meals, at snack time, accompanied by a tea or coffee (of course Turkish). Like many dishes of our country’s cuisine, most of the Turkish desserts are found in other countries of the region (Greece, the Balkans, Armenia, Lebanon, Israel and Syria) due to a common Byzantine and Ottoman past.Most of you probably know the famous baklavas and Turkish delights, and for some the Künefe, but you will see that the Turkish cuisine also offers surprising desserts with pumpkin, cheese and even chicken breast. Love it or not, Turkish desserts are worth a look and will not let you indifferent. Here’s a list with an overview of the desserts that you will come across in the windows or menus of Istanbul’s restaurants. This is by far the most famous of Turkish desserts. Its origins date back from the time of the Byzantine Empire, although its shape and current recipe were developed during the Ottoman Empire. The baklava is a bit of a “mille–feuille” of phyllo dough (yufka in Turkish). In Turkey it is traditionally prepared by stuffing pistachios, nuts, or more rarely almonds or hazelnuts between layers of yufka leaves. 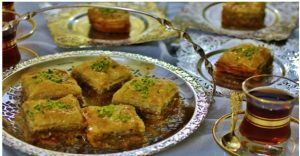 The city of Gaziantep in southeastern Turkey is famous for its baklava with pistachios and sees itself as the birthplace of this dish.Although found everywhere, it is a dessert very hard to do and must be eaten fresh out of the oven. The Kunefe is a cake that is traditionally eaten in kebab restaurants, it is not found in pastries, because this is a dessert that must be eaten hot. Originally from the south of Turkey, it is made from angel hair, Turkish cheese which is called dil peynir (local version of mozzarella) butter and sugar syrup. We strongly recommend you to taste one of this babies, accompanied by a warm Turkish tea. 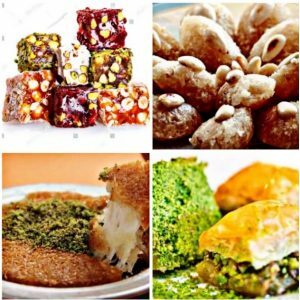 Like the baklava, Turkish delights are sweets known worldwide and spread throughout the Mediterranean basin, but it’s in Istanbul it finds his roots, invented in 1776 by the Ottoman confectioner : Haci Bekir. 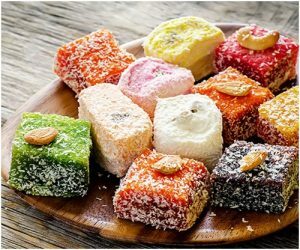 First known as the “rahat lokum”, meaning “rest of the throat” in Turkish, because these fluffy bites were enjoyable to chew, the Turkish delight is made from cornstarch, sugar and fruit paste or nuts. It was a widespread candy among the ladies of high society during their afternoon teas. Turkish delights were also used as a love proof among couples. This candy made the happiness and success of Haci Bekir and his shop (which still exists in the Eminönü district). He was also appointed chief confiseur of the Court of Sultan Mahmud II. Today they are found everywhere in the tourist district of Sultanahmet, including the Spice Bazaar, but we recommend you to prefer small boutiques in less touristic neighborhoods offering only Turkish Delight because they are of higher quality, made without sweeteners and artificial preservatives. In Turkey, people even eat meat for dessert. One of the country’s most famous after-dinner treats is simply named “Tavuk göğsü,” which literally means “chicken breast.” And that’s exactly what goes into this sweet pudding. According to legend, the unusual creation was born one night in the gigantic kitchens of the Palace of Topkapı, one of the main residences of the Ottoman sultans. In the middle of the night, the sultan at the time supposedly asked for something sweet, and since no one would ever risk denying the request of royalty, the cooks used the only thing left in the kitchen: chicken. That turned out not to be such a bad idea—Turkish people still can’t get enough it. 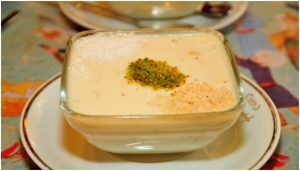 The Güllaç is an Ottoman dessert that is found especially during the month of Ramadan, it is cited in a cookbook retracing the banquet celebrating the circumcision of the son of Suleiman the Magnificent in 1539. Considered as the ancestor of the baklava, the güllaç whose etymology comes from “Güllü-aş” or “rose meal” has a unique texture with ingredients such as rose water, walnut, pomegranate and milk . You can also find other fruits in some variants. To prepare güllaç you must dip very thin sheets of phyllo dough in some sweet milk, then once well softened, superimpose them in a plate. Every two or three sheets of phyllo dough you sprinkle the preparation of walnuts, hazelnuts, pistachios, ground almonds or coconut powder. Then the dish is covered with the milk used for dipping, fragrant rose water and / or vanilla. Everything is usually decorated with a line of chopped pistachios and a candied cherry (or pomegranate seeds, if in season). “Ayva tatlısı” means quince dessert. These are half quinces cooked in a light syrup, then in the oven and finally into a thicker syrup. 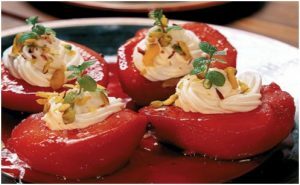 After over an hour of cooking you have a very tender and sweet quince that is eaten with a spoon, and always served with “kaymak” a delicious buffalo milk cream. It is also sprinkled with pistachios or walnuts. 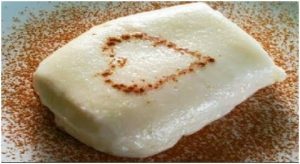 The Muhallebi is a milk-based pudding, rice flour and mastic. It is a thick cream that is usually flavored with rose, orange blossom, saffron or cinnamon. It is a perfect refreshing dessert during summer, with pistachios often added on top. – Tahin helvası : it is a compact helva with a sesame base. It is usually sold in the markets and in candy shops. – Irmik helvası : it is a helva made of semolina also called the “winter helva”, it is often served with a scoop of ice cream. 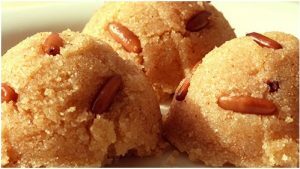 – Un helvası : helva made from wheat flour, it is not available commercially, it is a homemade bereavement. It is a Muslim tradition to prepare helva and distribute it to neighbors the 7th day, 40th day, and year after following a death.